ARABIC OCR SYSTEM ANALOGOUS TO HMM-BASED ASR SYSTEMS; IMPLEMENTATION AND EVALUATION. Despite 35 years of R&D on the problem of Optical character Recognition (OCR), the technology is not yet mature enough for the Arabic font-written script compared with Latin-based ones. There is still a wide room for enhancements as per: lowering the Word Error Rate “WER”, standing robust in face of moderate noise, and working on an omni-font open-vocabulary basis. Among the best trials done in this regard so far comes the HMM-based ones. Elaborating on this Automatic Speech Recognition “ASR”-inspired promising approach, our team has significantly refined basic processes and modules deployed in such architectures “e.g. lines & words decomposition, features extraction, models parameters selection, language modelling, .., etc.” to develop what is hoped to be a truly reliable “i.e. low WER, omni fontwritten, open-vocabulary, noise-robust, and responsive” Arabic OCR suitable for reallife IT applications. This paper extensively reviews the HMM-based approach for building Arabic font-written OCR’s in general, and our work in specific. It also reports about the experimental results obtained so far showing that our system outperforms its rivals reported in the published literature. Although current design codes include detailed methodology for the design of beams, no provisions for the design of composite beams with web openings are incorporated. In this research, an elaborate finite element model for composite beams with web opening is developed. The model is verified by comparing its behavior with available experimental tests. The finite element model is used to conduct a parametric study to investigate the effect of opening location, depth, width, and vertical eccentricity on the behavior of the beam. The model is extended to take into consideration the material non-linearity, the shear connector non-linearity, and the geometric non-linearity. The extended model is used to determine the failure load for beams with different web opening geometry. 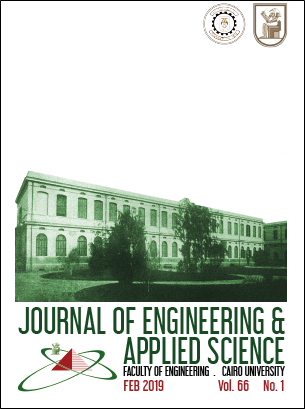 Simplified approaches for modeling composite beams with web openings are presented and results are compared with available experimental tests and finite element model and limitations are investigated. The shoreline changes in the vicinity of offshore breakwaters are significantly influenced by the geometric parameters of offshore breakwaters. The complexity of the behaviour of shoreline changes behind offshore breakwaters makes it difficult to predict analytically these changes. As a result, numerical models are frequently used. In this paper, Artificial Neural Networks (ANNs) are developed to predict the shoreline changes behind offshore breakwaters. The developed ANN models can accurately predict the salient size, XS , the sand deposited volume behind offshore breakwaters, VS , for a known set of geometric parameters of offshore breakwaters. Four geometric parameters are found to be important, they are: the breakwater length, LB, the offshore distance of the breakwater from the original shoreline, XB, the surf zone width, Xb and the gape spacing between adjacent breakwaters, GB, respectively. A comparison between ANNs and regression models for predicting the salient size and sand deposited volume is presented and the advantages of utilizing ANN methodology over regression techniques in model development are highlighted. This paper proposes a dynamic search based optimization algorithm for solving dual security constrained economic load dispatch problem in modern power systems. The proposed research paper presents a multi-objective Dynamic Random Neighborhood PSO “DRN-PSO”, which uses random neighborhood of every particle every time we need to know the experience we got in the swarm. This helps the diversity of the swarm to be preserved in order to discourage premature convergence. Moreover, the proposed algorithm uses dynamically adjusted Inertia weight to balance global exploration and local exploitation. Simulations were conducted on IEEE 30-bus test systems and compared to other optimization techniques that reported in the literature. The obtained results demonstrate the superiority of the proposed DRN-PSO compared to other optimization techniques that is reported in the literature. Additional economic benefits with secure settings are fulfilled, while preserving all system constraints within their permissible limits. The proposed algorithm improves the economic issue as well as enhancing the power system operation in the technical point of view with acceptable levels of emissions. So, it can be considered as a promising alternative algorithm for solving problems in practical large scale power systems. A method to evaluate the seismic collapse performance of frame structures through a probability-based assessment procedure is presented, considering uncertainties in both the ground motion hazard and inelastic structural response to extreme input ground motions. The procedure includes a new seismic-intensity scaling index that accounts for period softening and thereby reduces the large recordto-record variability typically observed in inelastic time-history analyses. Equations are developed to combine results from inelastic time history analyses and a sitespecific hazard curve to calculate the mean annual probability of a structure exceeding its collapse limit state. The kinetic parameters for grafting and dyeing acrylic acid-grafted Poly (ethylene terephthalate) PET fabric has been studied. Optimum grafting and dyeing conditions have been evaluated. The effect of acrylic acid (AA) and Sandocryl Blue (SB) dye concentrations on the yield-time relationship was investigated at different test temperatures. The reaction order and rate constant for radiation grafting and dyeing PET fabric were calculated from logarithmic plots of grafting and dyeing rates versus AA and SB concentrations. The order of the grafting process increases linearly with the increase in radiation temperature. It increases at a rate of 0.01/oC with a value of 1.32 at zero oC. The dyeing process follows 0.5 order reaction and is temperature independent. The reaction rate constant (k) is found to increase exponentially with temperature according to Arrhenius relationship. The preexponential rate constant (A) for dyeing is 1.61x104 times higher than that of grafting. The apparent activation energy (Q) for grafting and dyeing processes are 22.53 and 12.73 kJ/mole respectively. Ethylene is the essential material for producing oxygenates, which are used as gasoline additives designed to enhance the octane number. Due to the dramatic rise in the use of fuel oxygenates, catalytic dehydration of ethanol to produce ethylene was performed over transition metal catalysts (Fe2O3, CoO and NiO/clay). The reaction was carried out in a pulse microcatalytic reactor operated under atmospheric pressure at reaction temperature ranging between 250 to 400oC. The reaction products are mainly composed of diethyl ether, which formed at the lower reaction temperature, and ethylene that formed at the higher temperature, on using nickel and cobalt catalysts. Meanwhile, on using iron catalyst, ethylene is formed at the lower and higher reaction temperatures.